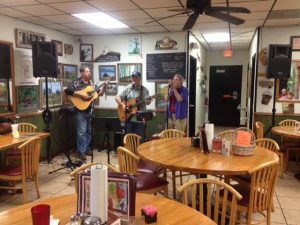 On a rural corner in Osteen, Southeast of Deltona, in a neighborhood where cows are more common than night spots, food, people, and music blend to create an experience not found in larger venues. The diner is the realization of a dream for Ken and Ruth Schiffermiller. Literally. Ruth had a dream and while looking for property in Osteen they stumbled upon the diner Ruth had seen in her dream. They bought the diner in 2007 and began fulfilling that dream. 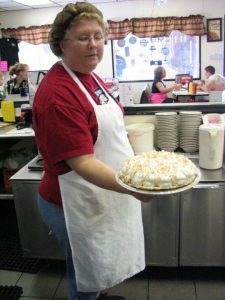 The Osteen Diner is known for home-style cooking. A blackboard lists the daily specials in addition to an expansive regular menu. The regular menu lists appetizers, sandwiches, seafood, soups, salads, burgers and many breakfast items that are served all day. The homemade desserts and giant cinnamon rolls are known to be the best in the farming community. There is also an Acoustic Jam every Tuesday evening where friends and families gather to “come and set a spell” as Ruth’s Grandfather used to say. Enjoy stepping back in time with a visit to our little farm, listening to great music, and eating homemade country food.